There's a reason why Jessica Hawkins has been called "the queen of angst" by many readers, and if you've never experienced her writing for yourselves, then the beginning of her new series is an opportunity you shouldn't pass on. Violent Delights is the first in Hawkins's White Monarch series, and it really is delightful and darkly so! If you haven't picked up on what I'm trying to say--especially if you aren't familiar with this author's books--what I'm basically highlighting with this series starter is that it is a dark romance, so don't go into expecting cutesy and flowery moments and exchanges. 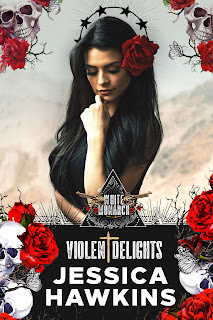 If you are a fan of well-written stories that have bite (and no, I'm not talking about paranormal romance involving vampires or werewolves) and may cause you to read non-stop for two to three hours, then I highly encourage you to peruse Violent Delights. Purchase Violent Delights on Amazon | Apple Books | B&N | Kobo.